501 East 11th Street ca. 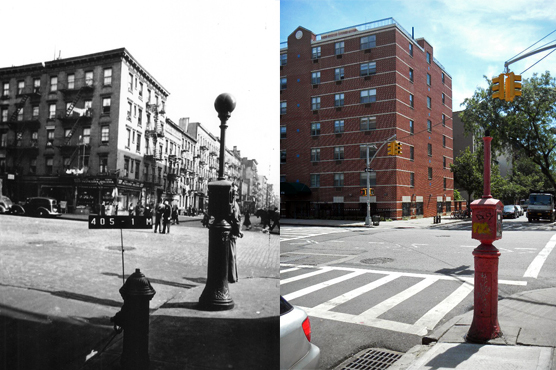 1940 (photo: New York City Municipal Archives) and today (photo: Frank Mastropolo). The senior housing complex on the northeast corner of Avenue A and East 11th Street hardly looks like a landmark of Beat culture. But there, at 501 East 11th Street, three buildings shared a courtyard where residents gathered to talk, eat and drink wine. Fifties-era hipsters called it Paradise Alley. The complex first drew attention in 1958 when Jack Kerouac published The Subterraneans, inspired by his affair five years earlier with black poet Alene Lee. The original version of the short novel was set in Paradise Alley, where Lee lived, and used her real name. For legal reasons, her character was re-written as Mardou Fox, one of the novel’s jazz club crowd; Kerouac’s character pursues an affair with Fox at her tenement apartment in what was changed to Heavenly Lane in San Francisco.